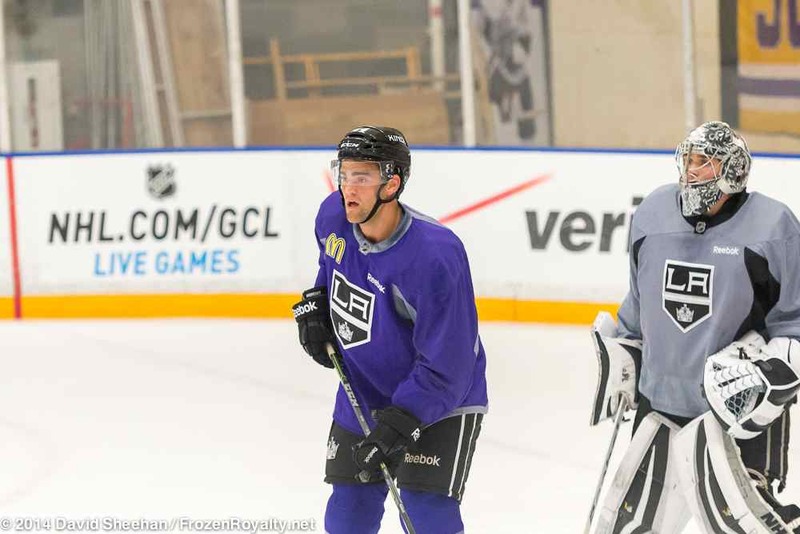 AUDIO: Story includes audio interviews with Brayden McNabb and head coach Darryl Sutter. EL SEGUNDO, CA — The Los Angeles Kings have finished their 2014-15 pre-season schedule, they have closed up shop on training camp, and after all the ice chips settled, there will be no surprises whatsoever on their 2014-15 opening night roster, which will be released later today. In fact, the only real “question,” if you can call it that, was whether or not two young players, left wing/center Andy Andreoff and defenseman Brayden McNabb, would make the big club’s roster out of training camp. But as previously reported in this space, both were a lock to make the Kings’ opening night roster, making the “question” pretty much a moot point. Those locks were secured on the morning of October 6, when the Kings placed forward Adam Cracknell and defenseman Jeff Schultz on waivers. Both were expected to clear waivers on October 7 and be assigned to the Kings’ primary minor league affiliate, the Manchester Monarchs of the American Hockey League. Waivers is a key reason Andreoff and McNabb are still with the Kings, and it might be the biggest reason. Both would have to be placed on waivers before being assigned to the Monarchs, and in all likelihood, both would be claimed by another team—the Kings will not risk losing them for nothing. When asked about both players, Sutter wasn’t interested in the waiver issue. Andreoff, who will wear jersey number 15, recalled his meeting with the Kings. Sutter pointed out that although Andreoff has made the big club’s roster, he has a long, uphill battle ahead of him just to earn some ice time. As a defenseman, McNabb is playing a completely different role compared to Andreoff. Nevertheless, he faces similar challenges in trying to get comfortable with the Kings’ system and trying to find his niche with the team. Sutter indicated that McNabb made a strong impression in training camp. Although McNabb made a good impression, he knows there are things he still needs to work on. Lots of work, indeed. That said, McNabb, who will wear jersey number 3, is in the National Hockey League, for now, anyway. One way McNabb will improve is by watching Doughty, who he was paired with during the Kings’ final pre-season game against the Colorado Avalanche in Las Vegas on October 4, at the MGM Grand Garden Arena—the annual Frozen Fury game. McNabb also took note of how Doughty communicates during games. Stick tap to LA Kings Insider Jon Rosen for contributing to this story. Could Forward Prospect Andy Andreoff Find Himself With The LA Kings In 2013-14?